Settling into my new home for the past couple of days, I have had to put up with a lot of noise from planes overhead. 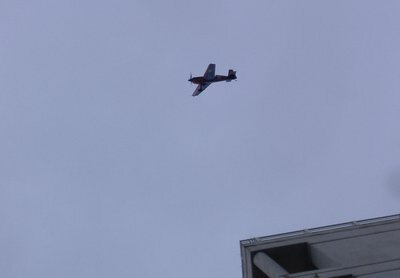 No, it's not short-haul flights to Europe from the London City Centre Airport that are buzzing over my house (though I do get those too), rather it is a bunch of dudes in single engine crop-dusters out to prove who is the best pilot. Red Bull (the energy drink company) sponsors a series of events called the Red Bull Air Race. The London event was held August 2nd and 3rd, and it is the 5th in a series of 9 races this season. The event is described in a few places as being like Formula One for airplanes, though given what I have seen of the event on TV and this weekend in person, it's probably closer to a Super G Slalom skiing event than a car race. Of course, given that Red Bull sponsors two teams in the Formula One and (as far as I know) 0 ski racers, I can understand why from a marketing perspective they probably went with the F1 connection. 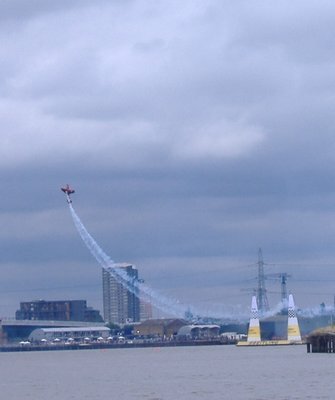 The competitors fly aerobatic planes with small wingspans (8 m) and high top speeds up to 426 kph. The course in London consisted of 8 gates which the competitors must fly through 4 times. 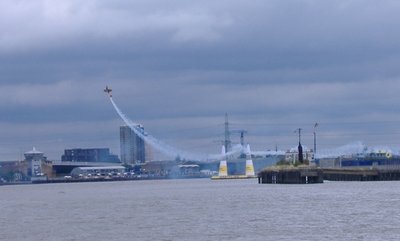 The event is a ticketed event (of course), but as it takes place over the Thames River, there are still free places to view the action. I went out on the 2nd and watched part of the qualifying. 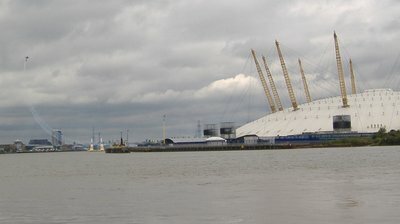 Situated on the west bank of the Thames River near the bridge on Preston Road looking over towards the O2 Dome, I was able to see a couple of the gates, including the start and end gate. The planes pass through the start and end gate three times - (1) to start, (2) to turn around and complete the course again and (3) to end. 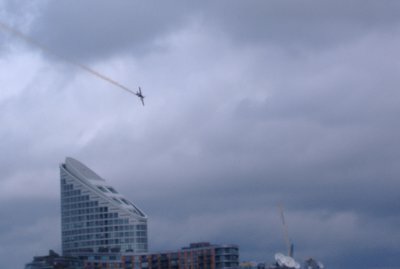 On the second pass through the gate, the planes do a half-loop, with a roll at the top to get themselves right-again in a move called a Half-Cuban Eight. I snapped some shots, which don't quite capture the kinetic energy of the event, nor the noise, but hopefully still entertain. 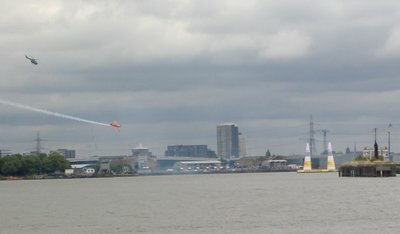 For those of you interested in such things, American Kirby Chambliss won the London event. He was the 2006 champion, and with the win today, he is in second place overall in the standings. Now, if you will excuse me, I am off to my local Sushi joint to see if they have a Half-Cuban Eight Roll on the menu. If not, I guess I will just get a Salmon Skin Roll.